Update 6/24: South Dakota Public Broadcasting tells us that LUX has been turned on. While the data could be interesting in weeks, don't expect official releases before the final months of 2013. You may also check a 14-minute TED talk on LUX from March 2013. Update 6/19: This astro-ph preprint says that LUX is already doing science and the results of a 60-day run will be out by the end of 2013, promising to brutally beat any competitor in their reach. Except for this short paragraph, this blog entry was posted on 6/10. Revisiting XENON100's Constraints (and Signals?) For Low-Mass Dark Matter. Recall that the set of underground experiments that are trying to directly catch the particles of dark matter is divided to two violently competing subsets: one of them, the axis, vigorously claims that there can't be any signal in the other experiments. The leader of this axis is the XENON100 experiment whose claimed constraints are far more powerful than the upper bounds on the cross section published by the XENON100's allies. On the other hand, the alliance of experiments that have already claimed to observe a rather strong signal of a dark matter particle, one whose mass seems to be 7-10 GeV (significantly lighter particles than those in the models that dominate in the phenomenological literature but in no way impossible), is apparently getting stronger every month. It seems that we're somewhere around 1943 in this particular war. At least since 2010, the traditional leader of this alliance has been the CoGeNT experiment that also claimed to have observed the seasons, sort of confirming previous similar claims by DAMA, another paleomember of the coalition. Juan Collar and N.E. Fields of the CoGeNT Collaboration have previously claimed that CDMS, formerly a member of the "dark matter is not seen" axis, was actually observing a dark matter signal as well, one that may have reached 5.7 standard deviations, high enough to claim a discovery. This general claim that CDMS was going to join the "dark matter is seen" alliance was confirmed in April 2013 when CDMS announced that the CDMS was seeing three events that looked like a pretty clear 8.6 GeV or so dark matter particle. It means that we have had almost two months to get used to the notion that CDMS is among those who effectively claim that "something seems to be there", a coalition that also included CRESST-II since 2011, which leaves XENON100 alone as a proponent of the thesis that all the dark matter hints claimed by others have to be bogus. This situation makes it natural to think about air raids on Berlin. Now, Dan Hooper claims that XENON100, the cornerstone of the dark-matter non-existence claims, is seeing two tantalizing hints of a light dark matter particle, too. The key image looks way too familiar from the recent CDMS charts, especially this one. 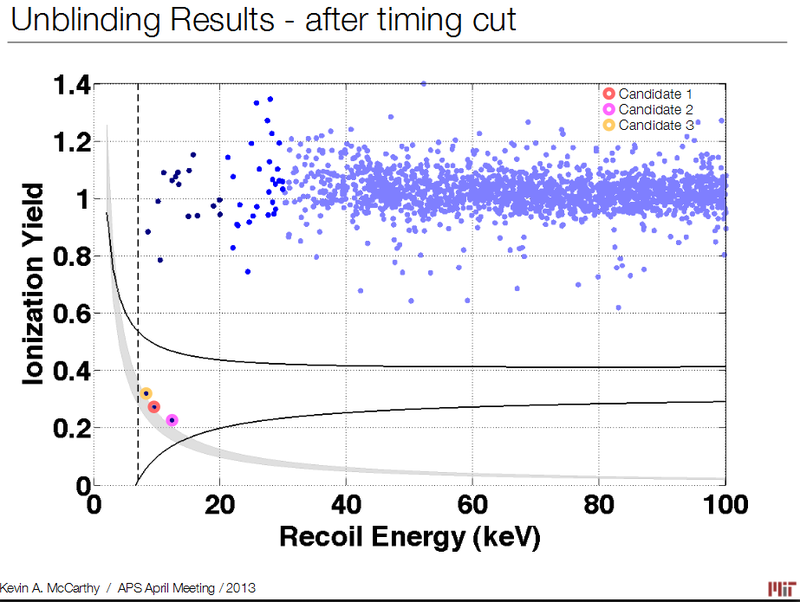 On the picture above, once again, you should notice two events that are significantly lower than the bulk of the background events although, for various technical reasons, the XENON100 papers have included them in the background as well. These events seem to be separated by a gap from the group of "clearly background-like events" and they seem to suggest the same mass of a dark-matter particle which would be unlikely if they were parts of some noise. And the mass is compatible with the 7-10 GeV interval indicated by the other experiments. Based on common estimates, one could have expected up to 50 dark matter particles (which is much more than 2) to have been observed by XENON100. That's why the XENON100 folks are so self-confident in their claim that the dark matter particle with the parameters suggested by others can't exist. Hooper exploits conservative "what if" adjustments of various efficiencies and other boring and mundane parameters of the XENON100 experiment to claim that just 2 events of the sort could still be conceivable. If this "yes, a particle is there" interpretation is right, then – according to Hooper – the emerging LUX experiment in South Dakota (which is also based on xenon and may be viewed as a superior sibling of XENON100) should see something between 3 and 24 events a month. If the answer is "Yes", then LUX could settle the argument about the existence of the particle rather quickly. Needless to say, dozens of dots near a curve which are sharply separated from the rest would be rather spectacular. Superman is looking for a glitch in LUX. The LUX website hasn't been updated for two months but it may be due to the webmaster's laziness or the experimental physicists' having something more exciting to work on these days. L.A. Times ran a fun story about the state of the experiment two months ago. There was a videochat with the LUX (and Majorana Demonstrator) experimenters today. Are not Dark Matter and Dark Energy merely today's version of epicycles? Just there to save the appearances? Dear Bob, there's no similarity between epicycles and dark energy/dark matter except for the fact that all these concepts were designed to match the theory with the precision experimental data - something that you dismissively describe as "saving the appearances". Well, Dark Matter was originally proposed to solve the galaxy rotation problem. Milgrom showed one way of doing that via MOND. Admittedly, that was a very unsatisfying solution. But to an ignorant layman, DM doesn't seem any better. Are we really to believe that only 4% of the universe's mass/energy is ordinary matter? How about the similarity between the the dark matter concept and the aether concept? While more money has been spent searching for the dark matter than was spent searching for the aether, these two concepts both served to keep the the old (standard) theory alive. The aether chase was finally abandoned when an enlightened theory came along--Special Relativity. There is a similar great reason to give up the billion-dollar dark matter chase. Abandoning it will lead to a better theory of gravity--which we need because among other things we will be able to harness the gravitational force. The Tully-Fisher law says that a galaxy's light is proportional to its highest orbital law. Thus we should seriously examine Kepler's idea that it is the Sun's light and not its mass that attracts the planets. Urgent: Lumo, your antitroll firewall needs an update, you have a security leak here ! Ignorance allows one to believe whatever one wishes. I believe studying the literature will assist to cure ignorance. What nature has to tell us is independent of belief but ignorance does not assist finding out what she has to say. The observational evidence for for the existence and the relative abundance dark matter is indisputable. You can choose to remain an ignorant layman, Bob, or you can try to learn something. TRF is a great place to start! Peter, did you say it's the Sun's light and not mass that attracts the planets? That's interesting. If she said "oova" in Czech, it would denote herself – a "chůva" [(kh)oova] is a nurse or someone who babysits, e.g. an au-pair. Also, the impotency to say H shows that Yekaterina the Tsarevna and other Russians have learned many things, including speaking, from the French. The Russians think that they can't pronounce H, either. In St Petersburg, they even have a French-sounding Hermitage which is just Ermitazh for them. "Search for Gamma-ray Spectral Lines with the Fermi Large Area Telescope and Dark Matter Implications"
"In 1920, at its Annual General Meeting, Aktiebolaget Elektromekaniska (wholly owned by Wenner-Gren-dominated Elektron) changed its name to Aktiebolaget Elektro-lux. The new name was a combination of Elektromekaniska and Aktiebolaget Lux. ( "Aktiebolaget" means "Company" or "Corporation." Most Swedish companies contain "Aktiebolaget" in the name, or the abbreviation "AB.")" TRF is that. Once one has spent time here, it's value amazes. Given the dark matter's abundance over the ordinary matter, a natural question to ask is where that much stuff comes from? Does any existing cosmological models tell us what the origins of the dark matter may be? Is it a relict of the Big Bang like the microwave background? Dear Alex, yes, of course, any contemporary astroparticle model of cosmology must correctly explain the origin of dark matter and its abundance. The most widely believed broader type of dark matter is WIMP, weakly interacting massive particle (weak means weak nuclaer interaction), and the most motivated kind of WIMP is LSP, the lightest superpartner in supersymmetric theories, probably a neutralino (or gravitino) - neutralino may be wino, bino, higgsino, or some superposition. Yes, it's like CMB: It is generally assumed that WIMP is a thermal relic so it behaved as "radiation" when the temperature of the Universe was high enough, a short time after the Big Bang, and this radiation was in equilibrium with everything else, including photons. Heavier amount of dark matter survived than visible matter's roughly because the visible matter tended to annihilate itself (protons vs antiprotons etc.) which destroyed most of it. Dark matter may also annihilate with itself (WIMP is typically its own antiparticle) but the probability of it is lower so it survives more. Note that if photons are created out of the annihilation, their contribution to the Universe's energy decreases more quickly than that of dust-like matter because as the Universe is expanding, the photons' wavelengths go up as well which reduces their energy as 1/a. There may be various models in which dark matter or something else was created by some out-of-equilibrium or otherwise non-thermal processes. And if she said it in Spanish, it would mean "grape." In the early 1960s a couple of Russians visited Harvard and were going around calling it "Garvard" or "Khavard." I' ve just discovered the new up-voting feature! In the UK, the media are eagerly reporting a claim that dark matter could potentially be comprised of Majorana fermions interacting exclusively via an anapole electromagnetic moment. As a layman, this means sod all to me. What is your take on it? Is it plausible or is it hogwash? I think that at least the hype is an artifact of the ignorance and special interests of the journalists. There's nothing special - more likely to be true, more original, better in any respect - about this paper relatively to thousands of other phenomenology papers that are released every year. so it's like a quadrupole moment with an extra gamma5, roughly speaking. It's far from being the leading moment but in some contexts, it may be important. Calculations of particular models take these contributions into account, together with many others. This interaction is one of the first allowed ones for Majorana particles. The author make a big fuss out of the proposal that the dark matter particles may be Majorana fermions. But this suggests they have no clue about the model building: the most widely believed types of WIMPs *are* Majorana particles. The LSP is most likely a neutralino - wino, bino (or photino, zino) or higgsino - and those are neutral Majorana fermions. It's not clear to me why they are excited or pretend to be and it's not clear to me why they isolate the anapole interaction term from others. My recommendation would be to ignore this media explosion as yet another meaningless noise. It's not a "complete" crackpottery in this case but I do think it's a paper by people who are not quite on top of this cosmological-particle field. This is off topic. The latest Scientific American has a story about the Bayesian Interpretation of quantum mechanics. To my mind, the Bayesian interpretation is interesting, but ultimately not an 'interpretation' of quantum mechanics. It posits that epistemological belief revision implies the ontological Born rule. Instead, I think, one should keep contextuality (as we must) but use 'contextual ontologies'. That would explain the Bayesian behavior of quantum mechanics, and provides an interpretation.